In 1844 the inhabitants of Dundee had their attention drawn to, “the evils and consequences attending the practice of burying the dead within the populous precincts of large Towns, and whether regarded as a point of taste or feeling, or the safety to the health of its inhabitants, it is now generally admitted that the custom should be discontinued whenever practicable. The spread of education – the consequent greater intelligence that is abroad among all classes – and the ready appreciation of what is beautiful and appropriate, have led to desire that the style, the situation, and the whole arrangements of Public Burying Ground should be greatly improved.” The townsfolk were persuaded and the Dundee Cemetery Company was launched as a limited stock company. The applications for shares more than doubled the number sought. In March, 1845, notices appeared in the press that a site had been chosen and that the Directors were ready to receive applications for the laying out and ornamenting the grounds and, furthermore, a premium of fifteen guineas was offered for the plan that gained most votes. From the five designs submitted that of James Findlater was the most popular. He was also the most experienced as, in 1832, he had planned the New Burying Ground at the foot of Constitution Street. Findlater laid out the oldest section of the cemetery, that bordering Perth Road. The upper sections, which included a quarry to the west, were developed two decades later. In 1884, faced with completion from the new Western Necropolis, (Balgay), the Cemetery Company head-hunted Gordon Rae from the Craigton Cemetery near Glasgow to extend and upgrade the grounds. 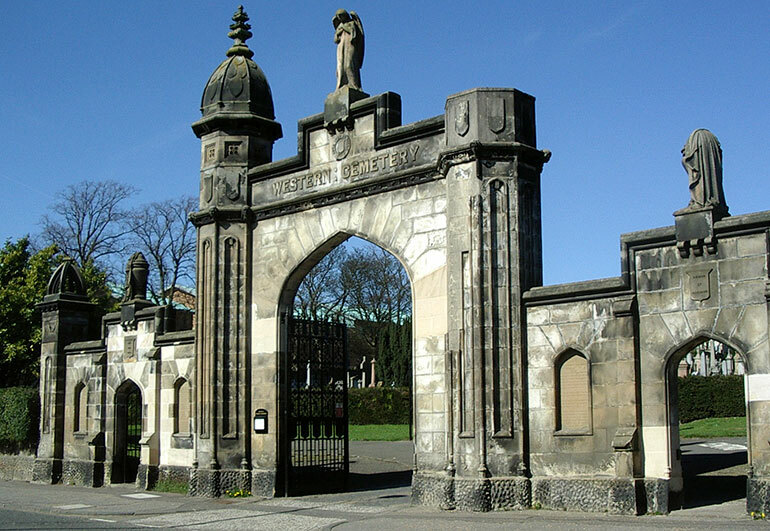 James Findlater managed to incorporate most of the traditional symbols of death and resurrection in his design for the entrance, regarded for many years as the most handsome in Scotland. A burst of lightening in May, 1953, shattered the statue of the burning bush on top of the east gatepost, and, sadly, this has never been restored. That decade also marked the decline of the cemetery into near dereliction. In 1979 most of the site was purchased for £1 by the then District Council. The north portion is now set to become a private burial ground again and, in 2014, the City Council designated a strip along the west wall for the interment of cremated remains. The symbol of an inverted torch, seen at the entrance and throughout the cemetery, was chosen as decoration, not only to represent the Christian belief in life eternal, but as a reminder that, when this life is extinguished, the dead gain new life through our stories and memories. Visit the Dundee Western Cemetery Association website.